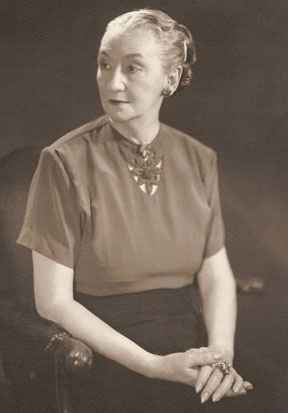 Hailed as "the most significant individual contributor to Hawaiian art in the 20th century" and "without question the greatest interpreter of the Hawaiian figure," Madeline Grace Cook, Lady Tennent — commonly known as Madge Tennent (1889-1972) — was born in Dulwich, England. When she was five she moved with her family to Cape Town, South Africa. At the age of twelve, she entered an art school in Cape Town, and the following year her parents, who recognized and encouraged her talent, moved to Paris to enable Madeline to study there. In Paris, she studied figure drawing under William Bouguereau, an experience that laid the technical foundation for her later figural drawings and paintings. She and her family subsequently returned to South Africa, and after her marriage in 1915 to Hugh Cowper Tennent (KBE), she relocated to his native New Zealand. In 1917, they moved to British Samoa, where Tennent's fascination with the Polynesian people blossomed into an artistic love affair. While on leave in Australia, she studied with Julian Ashton “and learned,” she said, “to draw for the very first time." Julian Ashton founded the Sydney Art School in 1890. He was an ardent disciple of Impressionist painting and claimed to have executed the first plein air landscape in Australia. In 1923, the Tennents left Samoa to go to England, stopping in Honolulu en route. They were entranced with the Hawaiian Islands and decided to stay. In those early years, Madge Tennent helped to support her family by taking commissions to paint and draw portraits of children. A friend’s gift of a book on Gauguin set her on an artistic course that lasted 50 years, during which she portrayed Hawaiian women in an innovative style that became increasingly individualized and unique. As an artist in her own right, Tennent was active in Hawai’i from the late 1920s until the 1960s. “The Hawaiians are really to me the most beautiful people in the world," she once said, “no doubt about it – the Hawaiian is a piece of living sculpture”. Using grand swirls of oil, Tennent portrayed Hawaiian women as solidly fleshed and majestic – larger than life – capturing in rhythmic forms the very essence of their being. They are strong, serene and proud. Her method of working with impasto – applying thick layers of paint to achieve a graceful, perfectly balanced composition – is evident in works such as Lei Queen Fantasia. Everything on the canvas whirls. The paint is applied in whirls in what might be called the “Tennent whirl” – the colors bright and luminous. Tennent envisioned Hawaiian Kings and Queens as having descended from Gods of heroic proportion, intelligent and brave, bearing a strong affinity to the Greeks in their legends and persons. She was criticized for her portrayal of larger size women but to her Hawaiian women fulfilled the standards of classic Greek Beauty. In 2005, Hawai'i Preparatory Academy was chosen by the Trustees of the Tennent Art Foundation, founded in 1954 by Madge Tennent herself, to become the caretaker of the collection. It is the world's largest intact body of Tennent's work.